The Great Lakes boasts some wonderful maritime history, and the Wisconsin Maritime Museum in Manitowoc focuses on this history, with emphasis on Lake Michigan. The museum offers visitors insight on World War II submarines, interactive exhibits, and interesting artifacts. It's quite the place to explore, with over 60,000 square feet of space. First called the Manitowoc Submarine Memorial Association when it was founded in 1970, it has grown into one of the largest maritime museums in the Midwest. The USS Cobia, donated to the Museum by the United States Navy, is perhaps the most impressive sight at the Wisconsin Maritime Museum. It is berthed next to the museum on the Manitowoc River, where 45-minute tours are conducted daily. See what life was like aboard a real submarine...where the sailors slept, ate, and showered. The longer "Nook and Crannies" tour lasts two to three hours and takes you in places not shown on the normal tour. You can even spend the night on the submarine. Manitowoc built 28 submarines during the war, making this city an important shipbuilding port in Wisconsin. If you've always wanted a behind-the-scenes look at a WWII submarine, then this tour is for you! Space is limited as it is a smaller tour, and only costs $7 per person, plus regular admission for non-members. These smaller tours last about 2-3 hours and will give each person a chance to see areas of the submarine not seen on the regular tours. Must be 16 years or older to participate. Please be advised, this tour includes ladders and smaller spaces. For reservations or more information call the Museum toll free at 866-724-2356. Spend the Night Aboard the USS Cobia! This is a once in a lifetime opportunity to really experience what the submarine lif is like! For $44, visitors will get to experience an appreciation of history and insight into a unique time in America's past. Overnight participants will receive a guided tour and overnight accommodation on board the World War II submarine. In addition to undertaking various educational activities, participants will be offered special supervised access to some non-public areas of the submarine and admission to the museum. For more information, contact the Wisconsin Maritime Museum at Manitowoc. See scale models of ships from the past, including a shipwreck diorama of the Edmund Fitzgerald as she looks lying on the bottom of Lake Superior. Learn about the various carferries that sailed between Wisconsin and Manitowoc, carrying passengers and railroad cars. They sometimes had to brave dangerous conditions on Lake Michigan because they sailed year 'round. Other fascinating exhibits include a 1900s 65-ton steam engine, an Aquatic Species Investigation Lab, and a Wisconsin-built Boat Gallery. Children experience how a vessel travels from Lake Superior, through the locks, and into Lake Michigan in the Children's Waterways Room. Relax and read about life on the water in the Little Lakefarer's Room, where you can play games and use a real periscope! The Wisconsin Maritime Museum is open seven days a week throughout the year. During the summer (July & August) they're open 9am-6pm. Fall (September & October) open 9am-5pm; Winter (November-mid March) open Monday-Friday 10am-4pm; Saturday & Sunday 9am-4pm. Spring (Mid March-June) open 9am-5pm. The Museum is closed all major holidays. Admission is $12 for adults, $10 for children ages 6-15, five and under free. Family discounts are available, as well as discounted rates to seniors, AAA members, WWII submarine veterans and veteran service personnel from any branch of the military. Active duty military members receive free admission with current ID card. 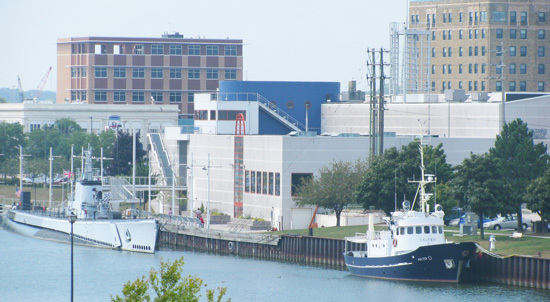 Interested in discovering more maritime museums around Lake Michigan? See our story about the Port of Ludington Maritime Museum. To reach Ludington, take the Lake Michigan Carferry S.S. Badger from Manitowoc, Wisconsin to Ludington, Michigan.